Maggie (Margaret Mary Catherine) O'Neill, who tells the story, lives in Stony Mill, Indiana, which is "your typical Midwestern town, with typical Hoosier (the nickname for the locals of Indiana) idiosyncracies. Staunchly proud of its position in the Bible Belt of the north", it is not where you might expect to find a number of witches, even if they call themselves N.I.G.H.T.S. (Northeast Indiana Ghost Hunting and Tracking Society). But Maggie who is told she is a "sensitive" herself, "a clairsentient ... an empath", gets more and more involved with them. At first she had been sceptical about "the superstitious world of magic". She was raised a Catholic and had grown up "firmly entrenched in middle-class America, with middle-class values and aspirations (although my mother would be the first to tell you I'm a habitual underachiever)". But "I wasn't such a great Catholic" and, after she starts to hear frightening warning voices, and realises she has "emotional memories" as well as having strange gut feelings about people, she begins to think she is having real supernatural experiences. Well on the way to becoming a witch herself, it appears. She happily drives around in an old and temperamental VW Bug called Christine, is very conscious that she is almost thirty (although at times she seems to behave more like a young teenager) and is not as slim as she used to be, having "an all too ample backside". She is a bouncy and gossipy character, and a determined questioner (often sounding remarably like a police interrogator) who can look after herself and put up quite a fight if necessary. 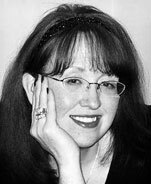 Madelyn Alt (1969- ) says that she spends her days toiling away in the mundane world of business and her nights writing tales of the mysterious. She is married and writes from her home, an 1870s-era Victorian in Northeast Indiana, where she lives with her husband and four sons. She explains in her myspace entry "The truth is, I'm just your average, run-of-the-mill small town Midwestern girl who was blessed at birth with an active imagination and a steadfast love for the written word. Writing is one of the best jobs in the world, I must say." She says that she "loves chocolate, Siamese cats, a shivering-good ghost story, the magic in the world around us, and sometimes, more chocolate." She explains that she has always been intrigued by the paranormal. But she had been writing for 14 years before she managed to get her first book published, the first of the Bewitching Mystery series described below. 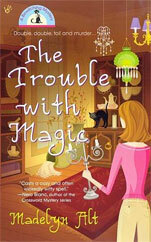 The Trouble with Magic starts with Maggie O'Neill leaning against a shop door to escape the rain and accidentally falling into what she finds to be an antique shop called Enchantments, run by Scottish expatriate Felicity Dow, who turns out to be a witch - but a friendly benevolent one. "Although I had to admit, with her salon-sleek hair and elegant clothes, Felicity certainly didn't look the part." Maggie, bored with her office work, is more than happy to accept Felicity's offer of a job. But on Maggie's very first day at Enchantments, Felicity is questioned by the police about the murder of her estranged sister - and later on she is arrested. Maggie, inspired and/or scared by eerie whispers and other strange voices, sets about trying to prove her innocence, going round questioning people - and finding herself attracted by the "masculinity" both of one of the policeman (although she rather oddly describes him as "a cretin") and one of the suspects, and was soon "all but drooling". He turns out to be "a really good kisser". She sounds here more like a silly young teenager than a woman approaching thirty. Eventually she is confronted by the murderer, and has to put up a brisk fight to save her life. Maggie announces blithely, "I could use a little magic in my life" and, despite her initial reservations, is soon convinced that if she had been prepared to believe in God, "then angels, devils and ghosts weren't too much of a stretch". Not for her, anyway. Especially after she had heard a non-existent dog outside her door, and Felicity had explained to her that "it was a spirit". Later on, Felicity explains more about the ghostly dog: "That was Cecil... Cecil is my family's animal totem. A spirit guardian. When I moved to the States, he followed me." Even Maggie has difficulty in swallowing this one! "You don't have to believe," Felicity tells her. "They can exist with or without your permission or acknowledgment." Maggie later confides to her best friend, "The idea that ghosts ... spirits ... whatever you want to call them, walk the earth ... it's a little too much for my poor brain to comprehend at the moment .... What's next? Fairies? Elves? Pixies? Trolls?" She giggled, but "it was a nervous giggle, because from there, it wasn't a huge leap to witches and magic. Real magic. Criminey." Once again she does not sound like a woman of nearly thirty. Maggie had "the uncanny feeling that she (Felicity) could see straight through me." It is Felicity who tells her, "Most people walk around day by day completely blind to the wonder of the world around them. They refuse to see the signs of the divine in all of creation, in the very patterns of life. If only they would pay attention ..."
"And you study these things?" I asked, trying to make sense of it all. "With a little help from my friends," she affirmed, and invites Maggie to meet her followers, fellow-witches. It is not a coven, it is explained, as Felicity is "a solitary" and practises alone. Felicity can, of course, do spells but chooses not to. As she explains to Maggie, "Except in the most extreme circumstances, modern-day witches abide by Karmic Law, or the Rule of Three. That, positive or negative, whatever we do returns to us three times as strongly somewhere down the road. We do not believe in manipulating the will of others in most circumstances, because we believe in treating others as we ourselves hope to be treated. And because our will is human and personal, we cannot possibly see the full ramifications of altering the plans the Goddess has set into motion." The basic plot is not very exciting, although towards the end Maggie feels that "things were coming to a head" and she is warned by a male witch to "Be careful. The veil beween the physical world and the spirit world is thinning as we speak. Darker forces never need much encouragement to try to affect the actions of humans. A thinning veil makes it that much easier for them to accomplish their goals," and he gives her a couple of magic stones, one of which comes in handy when she has to defend herself. Right at the end, Maggie tells us that "something was awakened that fall, something dark and powerful that in these early stages only sensitives felt ... The scope of evidence the N.I.G.H.T.S. had been quietly amassing .... gave proof we were not alone on this physical plane .... I too had sensed something on the horizon. Something that went beyond the real world and that delved into a shadow world that until then had been hidden to me. Real or imagined? You be the judge." Well, based on the sort of treatment it gets in this book, I'd say imagined. A Charmed Death tells how Maggie O'Neill witnesses an altercation between a local teenage princess called Amanda Lynn, and another young customer in the Enchantments antique shop, where Maggie has been working for two and a half months. This gets the story off to a good start. Then when Amanda turns up dead, Maggie feels compelled to investigate. Her interest in the occult leads her to join other members of N.I.G.H.T.S. (Northeast Indiana Ghost Hunting and Tracking Society) in their investigation of a haunted cemetery. Maggie admits to be scared of cemeteries, but Liss (Felicity, her boss) "showed me how to create a personal zone of protection made of pure white light. Built in the mind's eye, it was a defence not easily breached by negative forces." So that's all right, then. They try chanting and speaking to the supposed ghostly presences - but, despite recording "magnetic field disturbances" and the like, don't seem to get any meaningful answers. Maggie is solemnly told by another member, "You have a giant orb like Evie's. But yours has color. Violet? It's beautiful. huge, swirling with energy!" Unfortunately the author seems to take all this quite seriously. Maggie had tried her hand at dowsing too. As the old Amish man Eli had told her, she just had to stretch out her arm holding the piece of string with stone attached. "Breathe deep. Watch the stone. When you feel at peace, you ask to speak to your guide." Maggie frowned. "My spirit guide?" "How do I know I have one?" "Everybody have one. Some more than one. That little voice in your head that is not yours, ja?" Later on it is Liss who shows her how to move the pendulum over a dowsing chart in an effort to get direct answers to such questions as what happened to Amanda. But the pendulum "moved back into its powerful back-and-forth motion that indicated a waiting pattern." "Spirit guide," enquires Maggie, ever hopeful, "can you tell me anything that will help the police find the person who killed her?" It can, it seems, give her no help beyond spelling out the letters C-C-L-K. "Maybe my spirit guide just couldn't spell." reflects Maggie - but then she realises what the letters might mean - and goes haring off to uncover the next clue. With the aid of further spells, charms, and mystical intuitions, as well as the help of her boss, fellow witch Felicity Dow, she is able to identify the author of scandalous blogs that describe the sexual activities of Amanda and her friends, and she eventually gets to confront the murderer. Then it all ends in the conventional way with her trying to keep the murderer talking while she figures out some way of escape. It's obvious really: just use a bit of magic - and this is what she does. Maggie herself is a cheeky bouncy character: "That's right, people," she tells the reader, "I'm sensitive to the feelings of others as well as a whole host of other phenomona that sometimes spooked me senseless." She explains later that she had rejected both the Catholic teaching that witches, ghosts and magic "were tools of the Devil and to be avoided at all costs", as well as "the more secular viewpoint as taught in school, that they were nothing more than myths perpetuated by ignorance and fear and human desire ... Hey, a girl can change her mind, can't she?" Yes she can, but the way she describes it makes it all sound more flip than funny. It's no wonder that Maggie gets round to admitting. "I'm not sure what I believe." Liss tells her, "The important thing is that you allow yourself the time to discover what your God means to you, without the pressure or demands of outside forces. Listen to your own heart. You know the truth. It's there inside you. Inside each of us. Waiting to be remembered." Then the author immediately trivialises it all by getting Liss to suggest that they should weave a spell to make Deputy Tom Fielding of the local police department more interested in her. "Sounds good," says Maggie, sounding more like a schoolgirl than ever. "Do you think it will work?" "I'd bet my broomstick on it." Maggie describes how "I opened my mouth as surprise washed over me." Liss winked. "Just joking. I would never bet my broomstick. How on earth would I get around town?" Despite these welcome light touches, the plot is not really strong enough to hold the interest throughout, nor is it convincing enough to be taken seriously, or funny enough for this not to matter. 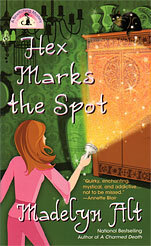 Hex Marks the Spot gets off to quite an interesting start. Maggie O'Neill accompanies her boss and fellow witch, Felicity Dow, to a countrywide craft bazaar. This is amusingly described: there were all "the predictable 'kuntry' crafts so many found charming these days. Cows, chickens, gingham, too many items decorated with that watered-down and ubiquitous blue that had been popular for at least a decade ... Even miniature two-seat privies for the country girls who had everything. And then there was the proliferation of bunnies of all shapes and sizes, phony eggs, and baskets with pastel grass, proudly displayed side by side with the crosses adorned with plastic Jesus figures, just in time for the upcoming holiday." Felicity falls for a handsome armoire (shown on the book cover), intricately carved by an Amish craftsman, Lucas Metzger. Maggie notices that this craftsman, Luc, is "an angelic vision ... all golden hair, twinkling eyes, and ruddy, sensual lips", and all the ladies have their eyes on him.When he turns up dead, with a strange hex symbol etched near his corpse, Maggie feels it is up to her to investigate further. It is, in fact, her third murder investigation in just seven months. At first all this is quite entertaining with a merciful lack of too many over-the-top occult experiences. Of course, she still feels faint from some spirit energy "running just below the surface of reality on the underpinnings of the astral tide," but perhaps you could put that down to nerves. Or was the dead Luc still hanging around with something to tell her? Marion, the local librarian, is convinced that there is at least one ghost (called Boiler Room Bertie!) haunting her premises but mercifully they have got used to him and so he is only a minor problem. Maggie remains attracted both by policeman Tom, now promoted to be Special Task Force Investigator, and by fellow witch Marcus. But she does not yet seem sure enough to commit herself to either of them. She is not sure about her religious beliefs either ("the jury was still out on that," she says), but can at least joke about the time when a mystic dark shape ("a big furry something") hurled itself at her in the dark, "opened its white-toothed maw .... and ... licked my chin." It turned out to be an over-affectionate dog. This works well. What is quite unconvincing is when the author tries to go all serious, as in the grand climax, when the murderer's "lips pulled back over her teeth in a primal snarl. Her face contorted. Flattened, I saw a shift, as though another face was superrimposed over the top of hers, the features merging so that you couldn't tell where one started and the other stopped." A sort of poor woman's Picture of Dorian Gray, in fact. But the Wilde story, unlike this one, was really terrifying. Maggie still remains remarkably immature for someone approaching thirty, and at one stage even tells us she is annoyed and feels "a pout coming on. I hated that. Pouts were for little girls, not grown women trying like hell to believe in themselves." But then Tom suddenly kisses her, "Heat, pure and primal, poured through my veins ... The only thing that was important was this moment, this man, and this wonderful, fluid warmth." Then off home he went. Not long after after, she is being kissed by Marcus: "I was .... busy enjoying the feel of Marcus' body crushing mine against the door. His hands were splayed on either side of me, flat against the planes of the door itself, as though he didn't trust himself to let them roam free. It didn't seem to matter, though - he was more than making up for it with the rest of him. As for me, at some point in time I'd wound my arms tight around his neck, and I was clinging to him like a drowning soul." And off home he goes too. By next morning "the guilt that had settled in the night before had managed to magnify tenfold. I was pond scum. Worse than pond scum .... I had nearly betrayed the trust of a most beloved friend (Tom)." Any humor here seems entirely unintentional. So she has quite a busy time. But, even though the plot is slow to unwind, and there is little really exciting action, there are some nice light-hearted moments and this is the most entertaining of the books so far. No Rest for the Wiccan sees Maggie watching TV reruns, minding the store (Enchantments, "Indiana's finest mystical antique shop"), and trying to figure out her love life. She still cannot quite make up her mind whether to go for Tom the policeman or Marcus the mystic. Then she reluctantly volunteers to care for her bedridden pregnant sister Mel and discovers that there are strange spirits hanging about Mel's house, so she enlists the help of her "witchy boss" Liss, and of N.I.G.H.T.S. (the Northeast Indiana Ghost Hunting and Tracking Society). When a friend of Mel's loses her husband who hurtles to his death from a tall silo, Maggie, convinced that it is no accidental death, gets involved in that too. It all works up to a dramatic climax in which everything nearly goes up in flames. It is written with a light amusing touch, with Maggie herself still doing all the narration, although she often sounds as if she is nearer 13 than 30, and keeps referring to herself as a girl, as in "A girl needed to have hope", "There are just some things that a girl needs to get clear in her mind" and "She was exactly what a girl should aspire to become". And every now and then she adds the comment "Oy" or uses a few extra full-stops as in "Really. Time. To. Go.". She herself admits that there is a "10 year old girl that still lived deep down inside me" . So she seems perfectly happy to describe Marcus as " a certain dark and dangerous hunk-o'-honey" about whom she admits to having had "a hellaciously good dream". In her favor it must be said that she does at least seem aware of her own immaturity as she comments, "Liss was the person I wanted most to be when I grew up at long last". The world of witchcraft with its Invisibility Enchantment, its good spirits like Coco (seen by four-year-old Jenna who "knew things") and its "breathing things", dark forces swirling around, spirit possession, visitors from the other side , fae or faeiries " of the feral kind" and even aliens, often sounds plain silly. The author sounds as if she takes it all so seriously too: when Maggie gets the beginnings of a migraine, Liss tells her that her recent experiences must have been "Just too much for your shields, that's all. Did you remember to strengthen them when you felt them slipping?" Maggie then has to explain to the reader: "Effective shielding was of key importance to a person with sensitive/intuitive tendencies. A method of reinforcing our personal boundaries - our auras - against the accidental intrusion of the emotions of others." So that's clear, isn't it? Easier to understand is a recipe for clearing rooms of evil presences. All that's needed, Liss tells Maggie, is "Sage, for purification. Lavender, for protection. Candles, for the quarters. An elements infusion, for anointing the doors and windows. Salt to consecrate the space. Herbal packets, to tuck away as blessings. And patchouli incense." "Patchouli incense .... for power?" Maggie asked hesitantly. "Well, that, and because it smells lovely." If only the author has left it there, it would have been fun, but she goes on to get Liss to explain in all seriousness: "Sometimes, the key to summoning the Light back into a place that darkness has chosen to invade can be quite simple. As simple as filling the room with pleasantries and our own energies. Things that make us happy and that are filled with good thoughts." Maggie's relationships with her ever-critical Catholic mother, and an old high school enemy, "the Witless Wonder, Margot Dickerson. Er, hyphen Craig", are amusingly described. She knows and regrets that she herself is not "a real psychic", although she explains, "I knew I was a sensitive, and had seen a ghost first hand; felt them more than once. I knew that I experienced emotions from both people and spirits, and residual energy from places. I even occasionally received thoughts at times that were never intended for me to hear." The author herself claims to have had some paranormal experiences. She explains on her website how this series had started: she had been sitting at her computer when she had heard "Maggie" speaking to her, "insisting that I take down what she had to say, word for word. A little taken aback, I opened a Word document and began to type. Three pages of monologue flowed from my brain to my fingers and out onto the screen in a kind of 'brain dump' I had never before experienced." Where There's a Witch sees witch Maggie O'Neill (almost 30) visiting a carnival where she comes across a construction worker arguing intensely with a young woman who is later found dead. The chief suspect is the construction worker, Ty Bennett, who was part of the crew that had unexpectedly unearthed a buried cellar, with "walls and ceilings covered with crosses" during the demolition of a local church. Now it's up to Maggie "to uncover the dark spiritual energy leaking into their time before it spoils everyone's fun". It is all written in the usual chatty style. with the possibility of a romance with either Tom the special task force investigator for the police or fellow-witch Marcus much occupying Maggie's mind. The odds seem in favour of Marcus for “once, not too long ago, he'd kissed me thoroughly .... I still hadn't fully recovered." But she knows how to get her man: “The slick of rosie gloss on lips can you have a distracting effect on even the sternest of men, doncha know." However, background events, such as a church fund-raising fete are convincingly decribed, as is local church opposition to “devil worshippers who have infiltrated our midst. Ghost hunters and witches? Occult practitioners?" (In other words, Maggie and her friends). Maggie herself is determined to track down the murderer and face up to the terrible evil that “was a force that simply was, is, had always been, and always would be looking about, somewhere in the shadows." This could take the form of hovering black shapes but luckily Magggie's cat Minnie could chase them off for her! Maggie does not claim to be an expert witch: “I wasn't adept at anything except for finding ways to include chocolate in my life. Instead, when I made a connection of the psychic kind, it tended to be random, erratic, and completely unpredictable." It is her witchly employer at the Enchantments Gft Shop who explains to her, “You seem to think that being a sensitive means being superhuman, capable of fighting crime and solving world hunger and leaping skyscrapers in a single bound. I rather think that we are extrahuman. We've been given an amazing gift to help us to traverse the rougher waters of life, an additional sense of understanding of the world and of people that most will never have." If this is so, it seems a pity that Maggie doesn't share more of this increased understanding with us - instead of concentrating on lightweight gossipy bits such as those about Marcus being "my own secret flame-thrower .... It was good to see him. Really good. Gosh, was it ever." The ending is far from convincing, but then the emphasis is on the scatty Maggie and her pals rather than on building up a realistic plot - and perhaps this is what the author most enjoys writing about, as well as what her regular readers really want. A Witch in Time describes how Maggie O'Neill, and her heart-throb, Marcus Quinn, are, like the rest of the family, amazed when Maggie's sister Mel gives birth to twins. It is when Maggie is visiting Mel in the hospital that she overhears a whispered conversation that sends chills down her spine. The next night, death visits the hospital ... twice. It is not a very interesting story. The plot itself is altogether too slight. Maggie herself is just short of her 30th birthday, and is as jaunty, cheeky and flippant as ever, but she still persists in calling herself a girl ("a girl has to show some loyalty" etc). She describes herself as an "empath - a sensitive who feels the emotions of others", but magic (or magick as she would call it) plays little part in this story (although she keeps hearing the voice of her dead grandmother who tells her, for example, that her hem was unraveling!) and, without it, there's not much to hold the interest except the over-blown love affair with fellow-witch Marcus. When the blue of his eyes "blazed a little hotter," she responded, "Gulp. Oh. Oh my." Later on, after she'd broken her ankle, and he'd given her a lift in his truck, he helped her by making her put her arms around his neck (hmm, gosh, I don't know ...), kicked the truck door shut (swoon! ), then carried her over the threshold of his house (um, double swoon!). Considering they'd already been in bed together and on the point of making love when they were unfortunately (if inevitably) interrupted by a phone call, her schoolgirl reaction seems distinctly over the top. Maggie's enthusiasm continues unabated when the next morning, after he'd given up his bedroom for her, and had a shower, she watched him shave: "I did peek. A little. Especially when he stood before the dresser mirror combing his hair and fastening it low at the nape. There was something about the shape of a man's body standing in that position, the width of the shoulders, the play of muscles, the way the towel clung to his hips, and how certain movements made the biceps pop out in a way that made my mouth go dry. All right, I'll admit it. I watched. The whole time .... Marcus took my crutches from me and swept me up into his arms again. I wasn't complaining. A modern girl I might be, but there was something very primal and attractive about a man who could exhibit Tarzan-like strength but still harbor a softeness and tenderness for his woman, too. Besides, it allowed me to be up close and personal with my guy and gave me the excuse to just gaze at his face in completely smitten admiration without looking like a total loon. Sigh!" It is all altogether too cosy and sentimental - so much so that you wonder if the author could possibly be laughing at herself. However, Maggie's erratic grandfather, known as Grandpa G, is quite an entertaining character who "is completely void of a PC filter" and continues to speak his mind and do exactly what he wants. When Maggie's bossy mother complains that he'd scared the pants off a neighbour by bursting out from the sheets she had on the line, he tells her, "If I'd scared the pants off her, I'da had another reason for the old ticker to keep going." It's not exactly sophisticated humour  but it's better than nothing! Home for a Spell sees Maggie O'Neill, who is still hobbling around with her leg in a cast, trying to move into a new apartment, but her new suspiciously-cheap dream home turns into a nightmare when the unpleasant apartment manager (who offers pretty young women reduced terms in order to entice them in) is found dead before she can even sign the lease. It is yet "another murder in Stony Mill", an outbreak that Maggie blames on untoward supernatural activities, but which the rest of us might attribute more to the needs of the author. Maggie soon finds herself searching, together with her jealous ex-boyfriend Special Task Force Investigator Tom Fielding, for what the blurb describes as “a frightfully clever killer". It certainly proves to be a remarkably unlikely one. Perhaps of more interest to the reader is her continuing relationship with Marcus, her “lovely new boyfriend .... whose inner beauty far outshone his outer deliciousnesss. Was it true love?" It's not long before she is falling into his arms (again), “dizzy with the crazy, wondrous delight that often filled me when I was with him". But then, of course, a phone started buzzing! But, as they've already been sleeping together, perhaps this does not matter too much. Although she still hears her dead grandmother's voice either encouraging her or ticking her off, she is not offered anything in the way of supernatural revelations, and the central mystery, involving a missing hard drive from a computer, is eventually solved by Marcus's computer skills and not by any use of his "magick" powers. We may all have spirit “Guides" who are "always working behind the scenes for us", as Maggie and Marcus both believe, but they speak only with "that still, small voice within us" - an idea lifted from somewhere else entirely. Maggie herself admits that “none of the murders in our town had involved the supernatural or witches or magick in the slightest" - which makes the witchy experiences, such as Maggie's absurd use of a Home Finding Spell, seem increasingly irrelevant. Maggie describes herself as “empath, intuitive, and sometimes witchy nice girl’, but she takes such a long time (not until page 264 out of 290) to realise the possible existence of concealed cameras, that you begin to wonder if, despite all her outward vivaciousness, she really isn't any too bright. But it's all mildly amusing. The author has her own multi-colored website (that in Octber 2012 needed updating) with links to her blogs, and also has her profile on myspace. Unfortunately the books are not always as amusing as the covers suggest. This cover is particularly effective as the torch's beam is covered with a grainy material that sparkles and feels rough to the touch. Mind you, at no point in the story does Maggie actually do what she is seen doing here! This is the most amusing of the books so far.